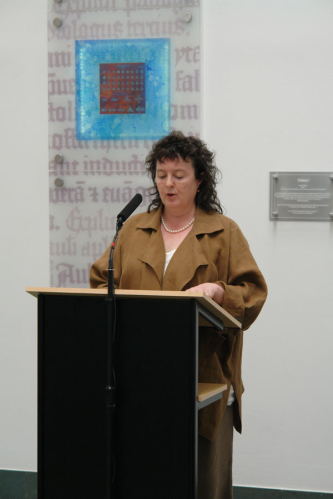 Poet Laureate Carol Ann Duffy unveiled my 11-metre high piece of public art at The University of Manchester’s world-famous John Rylands Library on the 20th May 2010. It was great to meet her and spend a bit of time chatting about using visual art and poetry together – something we’re both interested in. She recited a couple of her poems during her talk, which was a real thrill for me. A wonderful conclusion to a great project. This entry was posted in general, misc. Bookmark the permalink.